Why ANTARCTICA is Not Facing Global Warming Threats? BMC Wakes up to Recycling Waste, design revenue model. Deal at Lima Saves Climate talks, India Says it's Satisfied. BMC Promises More Trucks For Dry Waste. Ban on Plastic May hike Drug Prices. Centre, States to step up checks on plastic bag use. Tackling Overcrowding - Homes on Floating Platforms Made Largely of Plastics Bottles. 1st Bio-LNG Plant in Indonesia to be Developed by Wartsila. Under Rs. 10 Polythene Wrap Keeps Premature Babies Warm While Being Rushed to NICU. Kids to join PM's Clean- Up Campaign. Climate inaction could cost billions to Obama Govt. Need a planned approach to solve city’s transport woes: Vision docu..
Locals wage war against litter, Zero Garbage Week from Sept 6.. Subway Travelers Pay with Plastic Bottles.. This is the longest 100 percent recycled bridge in the country.. Your Waste can Generate Money..
High Court Slams BMC For Lacking Civic Sense..
Mumbaikars See Red On Climate Change.. Dump Sites that Glout Norms to be shut : GOVT. Plastic ban at stations bites into stall-owners earnings. 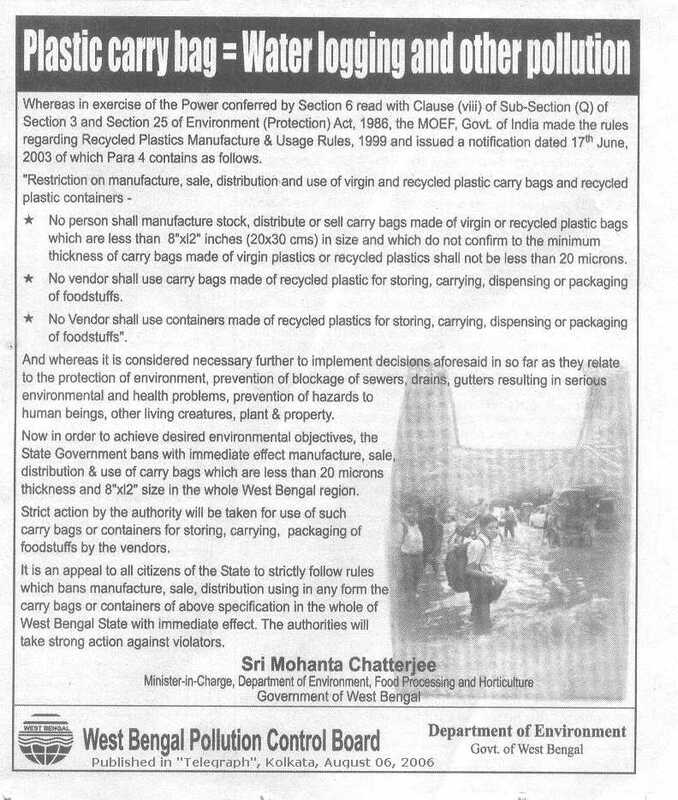 Government of Maharashtra Notification on Ban Plastic Bags Dtd 13/09/05. Making plastics the sacrificial goat really help ? University Park, Pa. -- In its latest "green" initiative, Penn State's College of Agricultural Sciences has converted all of its farm equipment to biodegradable, vegetable oil-based hydraulic fluid in an effort to reduce environmental damage from spills and leaks and cut cleanup costs. A silent tug of war over garbage segregation is on in Pali Village. According to the general secretary of the Pali Village Committee (PVC), Asif Farooqui, the problem has risen because only 20 per cent of residents are willing to separate their wet and dry garbage, despite garbage segregation being a BMC rule. Australian company Plantic Technologies was last night awarded the prestigious Australian Museum Eureka Prize for Industry 2004 for its biodegradable plastic. WE CAN now all do more for the environment with the news that plastic bottles can be recycled in Cambridge, South Cambridgeshire and East Cambridgeshire. Oil-derived plastics are losing market share to bioplastics, according to IBAW. 23 August 2004 – The use of biodegradable plastics has doubled between 2001 and 2003 to 40,000 tonnes, according to IBAW, the International Biodegradable Polymers Association. II $500,000 and two SBIR $100,000 grants received from the NSF small business program. CONVERT plastics back into oil? Is this possible? Yes, according to Koen Tech Co Ltd of Korea. 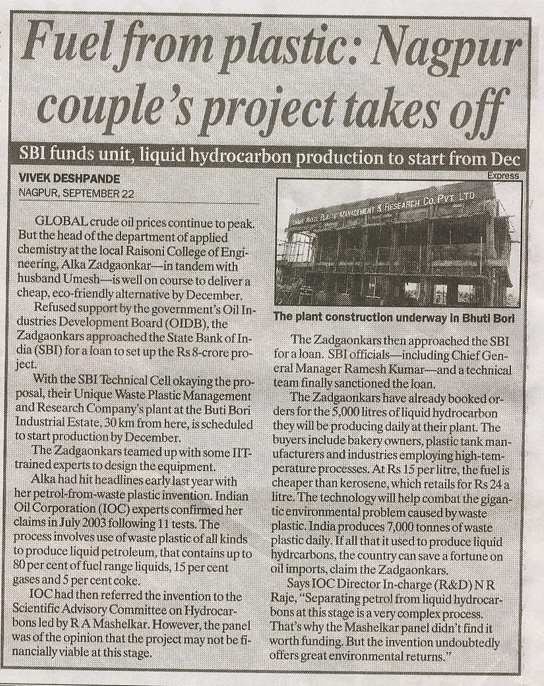 The company claims to have produced a machine that can produce fuel oils (gasoline, kerosene and diesel) from waste plastic and waste synthetic resin. Now, shop in biodegradable bags made from animal waste! Technology India > Sydney, Aug 13 : Scientists at the Environmental Biotechnology Co-Operative Research Centre in Sydney have developed green biodegradable plastic bags made from animal excreta or food waste that could soon could replace traditional plastic at supermarkets. Karyon Industries Bhd (KIB), which is headed for a listing on the Mesdaq market in mid-September, is setting its sights on becoming the region's most comprehensive polyvinyl chloride (PVC) and polyolefin-based compound producer in the next five years. An ESA-designed house that uses technology designed for space could become the basis of the new German Antarctic station, Neumayer-III. The new station has to meet stringent laws set up to protect the Antarctic environment, which is where the use of space technology comes in. Jennmar Corporation, Terrasimco Inc., NAPCOR and the TOP Bottle Project are pleased to announce a major new technology and application for the use of post consumer PET bottles. The process developed by Terrasimco Inc., a Martinsburg West Virginia technology company, has been licensed by Jennmar Corp. and will be used in the production of new types of roof bolt products that are used to reinforce coal and other shaft mines. Pittsburgh based Jennmar is the world’s leading supplier of roof control products for the mining and tunneling industries. Jennmar has six manufacturing facilities in the U.S., two in Australia, and a new plant under construction in China. Misleading and extravagant claims were being made about "degradable" plastic bags and their use could be harming the environment, an expert warns. The introduction of air-pillow packaging systems was one of those simple, yet brilliant ideas, offering lightweight, cost effective protection to the pack contents. But the one drawback has always been the pressures of environmental legislation which in today’s market is becoming more and more of an issue. Buyers are becoming increasingly aware of these issues and the cost implications can no longer be put to one side. Accra, July 14, GNA - Mr Ishmael Ashitey, Minister of State, Ministry of Trade, Industry and President's Special Initiatives, on Wednesday urged scientists to research into the possibility of producing biodegradable plastics that decompose in the soil. He said that would help curb the mounting plastic problems facing the country. THE EDITOR, Sir: WE NOTE with interest the front page news on Thursday, June 24 concerning the Government's misguided attempt to impose an environment tax on 'PET' plastic, the material used to make most beverage bottles in Jamaica. The article gave the impression that the bottles themselves were to be taxed, but as we understand it, the proposed cess was to be imposed on imports of the raw material, not the bottles. BERLIN - Berlin has introduced five talking waste bins which say thank you in three different languages or scream "goal" to help promote a cleaner city. The talking waste bins - which curiously say thank you in French, Japanese and English but not German - are located in an area popular with tourists at the central Potsdamer Platz and at the Zoo train station in the west of the city. TOKYO  Major textile and chemical maker Teijin Ltd said Saturday it has developed an advanced technology for recycling plastic bottles made of polyethylene terephthalate used for beverages. SACRAMENTO, CALIF. (April 16) -- Companies that sell plastic containers in California for nonfood applications could be required to use recycled content or take other steps aimed at reducing plastic waste, if a state agency has its way. The California Integrated Waste Management Board voted April 13 to tighten exemptions in state laws and essentially require that container makers for products such as detergents and oils prove that their bottles are environmentally friendly. What excites Floyd Dewey Gottwald, Sr. Professor of Chemistry William Starnes most about his recently patented organic stabilizers for PVC isnt the tremendous monetary potential the invention could bring him, the College and his department. Its the idea that his contribution to the growing $1.8-billion heat stabilizers industry could help save lives. SPRINGDALE, ARK. (April 22) -- Advanced Environmental Recycling Technologies Inc. has started operations at its largest plastic recycling plant, the company announced April 22. JFC has bought Delleve, manufacturers of Twinwall plastic piping and one of the UK's biggest plastic bottle recyclers, from owner Derrick Clarke for an undisclosed amount. Dublin City Council is aiming to increase the current recycling level by almost 30% over the next two years. The city council this week published the 2003 Annual Report in relation to the Waste Management Plan. Concerned over the use of plastics in campaign material during the forthcoming Lok Sabha polls, the West Bengal Pollution Control Board has issued an order to all political parties to utilise only biodegradable substances that do not pile up afterwards posing an environmental hazard. New Delhi, April 7: While the MCDs garbage segregation plan lags behind, students are pitching in to help. From April 15 for the next fortnight, students of 13 schools will be competing with each other in promoting the Home Composting system. Officials from the Cook County Forest Preserve District are hoping that their latest venture will help flush out one of the park's major problems. As of Friday all of the 228 wooden outhouses throughout the forest preserve district were starting to be replaced with new plastic portable toilets, or "comfort stations," as district officials refer to them. A TEAM OF RESEARCHERS at the University of Arkansas said that hybrid chips combining plastic and silicon could lead to flexible devices that promise to be cheaper too. Physics boffin Huaxiang Fu said he used solid state theory to look at a combo of organic material and inorganic semiconductors. If you garden, even a little, you know it doesn't take long to accumulate plastic plant pots. Unless you use them for basic-black container gardening, every new plant you buy from a nursery builds your collection of soil-sprinkled buckets. PLASTIC waste clogging up landfills could become a thing of the past, according to a fledgling Scottish company which has developed an innovative new method of recycling it without producing dangerous side-effects. Landfills throughout the UK currently swallow more than two million tonnes of plastic each year, with Scottish sites receiving 200,000 tonnes of that - yet according to start-up Greenward Environmental Technology, it could not only be successfully recycled, but also transformed into assets in a "safe and environmentally-friendly way"
Plastic reusable packaging improves the flow of product all along the supply chain, to reduce costs. These products are used to move, store and distribute product within a single operation or entire supply chain. From raw material to finished goods, plastic reusable packaging safely and efficiently moves material/product to its destination. These packaging products are ideal for multiple trip applications in a closed-loop environment or well-managed supply chain. These products can also be used effectively in a managed open-loop system, with reverse logistics in place to return empty containers or pallets for re-use or replenishment. As of April 1, New York City has reinstated the full recycling program that was scrapped two years ago. Banished in an effort to save the city budget, recycling is now making its return for the same reason. In order to close a $4.9 billion budget gap, Mayor Michael Bloomberg suspended glass and plastic recycling in July 2002. Bloomberg predicted that the cutback would save the city over $40 million a year, and justified the move to critics with the claim that 40 percent of materials collected for recycling were ending up in landfills and that the costs of recycling were "skyrocketing." Berkeley - University of California, Berkeley, chemists have found a way to make cheap plastic solar cells flexible enough to paint onto any surface and potentially able to provide electricity for wearable electronics or other low-power devices. In the journal Nature, the US researchers behind the discovery say it could let them pack a gigabyte of data into a sugar cube-sized device. The material is also very cheap to manufacture and data can be written down and read back from it quickly. The researchers predict that it could take only a few years to turn their discovery into working devices. NEW ORLEANS -- Finding an economical way to make a polyester commonly found in many types of bacteria into a plastic with uses ranging from packaging to biomedical devices is a long-held scientific goal. Such a polymer would be a "green" plastic, in that it would be biodegradable. For long, plastic has been identified as, and proved to be, a major ecological threat due to its non-biodegradable and carcinogenic nature. The state government has done its bit to regulate indiscriminate use of the material by enacting GO Ms. No. 25, dated March 30, 2001. But the order, flouted openly, has turned out to be a toothless one. It's a lesson in waste management. A garbage dump in Mumbai turned into a blooming garden using a simple concept of bio-culture. A few NGOs started the process of turning the garbage littered around the city into manure by using a device called Jivan Mitr. JAMMU : Jammu and Kashmir Polythene Manufacturers and Traders Association will launch a concerted campaign to create awareness among the general public about proper disposal of used polythene bags and other plastic products waste. By holding seminars, media conference and symposia at various levels, the association will bring home to the consumers of polythene carrying bags to not throw the used bags in the lanes and drains, rather deposit the same in separate garbage dumps, so that the same can be scientifically disposed off or recycled. PUUNENE - Officials at Maui Disposal want to remind residents that there are some plastics that cannot be recycled in the county's recycling bins. Greg Apa, executive vice president of Maui Disposal, said a large amount of "unrecyclable plastic" has been left lately in the county recycling drop boxes on Maui. "We're getting too much plastic that cannot be recycled and (also) household trash," Apa said. SYDNEY (Reuters) - If Australia replaces even a small percentage of its plastic bags with biodegradable carriers made from grains, it would boost demand for wheat and other grains by 500 percent over 15 years. "Alternative uses for starches are just going through the roof. (It) is absolutely massive," Kim Hatton, analyst with Pocknee and Associates Consulting, who prepared a report for the Australian grains industry, told Reuters. PUNE: Though the total amount of biomedical waste (BMW) generated by the smaller hospitals in the city is far more than that generated by the large ones, the smaller hospitals do not seem to be aware of the guidelines for disposing BMW. Is technology making you sick? If it hasnt yet, it just mightgiven the environmental crisis brought on by electronic waste. The U.S. Environmental Protection Agency calculates that more than 3.2 million tons of electronic waste is laid to rest in landfills each year. The Cellular Telecommunications and Internet Association estimates that 30 million retired cell phones will contribute to that pile as a result of number portability in 2004 alone. VTT has made bioplastic durable due to reinforcement with natural fibres. This biocomposite, which is totally biodegradable, supports sustainable development. The waste costs for products made from this will be small, and in the future consumers will have an enhanced appreciation of biodegradability of materials. VTT achieved this biocomposite using flax fibres to reinforce bioplastic. VTT also developed a method by which the properties of the completely biodegradable biocomposite can be tailored according to the projected use of the product. It is a further advantage that the new bioplastic products can be manufactured on the same machinery on which conventional plastic products which are only partially biodegradable are manufactured. The Minister of Trade, Industry and President's Special Initiatives, Mr. Alan Kyeremanteng has inaugurated a private sector-led Plastic Waste Management Task Force which is to contribute to the proper management of the plastic waste problem in Ghana. The Task Force comprises representatives of the National Association of Sachet Water Producers, Ghana National Association of Manufacturers of Plastics, Importers of Plastic Products, Users of Plastic Products and Recyclers of Plastic Wastes. 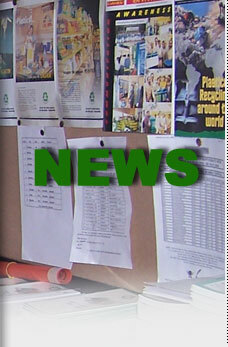 Background information and articles about plastics and recycling. The word plastic is from the greek verb "to form," and plastics can take almost any form. How Plastics Are Made, An introduction to the production process. What's driving us to do this is our complete understanding of the kind of price pressures our customers are under," said Carlos Garcia, a VP with Agere. "We'll continue to move forward with moving our entire portfolio to plastic packages." "The CRC researchers knew that biodegradable plastics was going to be the next big thing if someone could crack the price problem," explained Mr Mark Fink from the TSL Group, the company assisting the commercialisation of the technology. The material will be mainly used for dry foods packaging, such as the trays in biscuit packets or chocolates. Micro-organisms can break it down by burning the constituent sugars, resulting in carbon dioxide and water. The new body, the Co-operative Research Center for Sugar Industry Innovation through Biotechnology, would bring together leading research groups in sugarcane molecular biology and chemical engineering, the government said. Scientists from the new body would partner with organizations such as sugar producer CSR Ltd and U.S.-based DuPont Co, one of the world's major agricultural biotechnology companies. Biodegradable plastics made with plant-based materials have been available for many years. Their high cost, however, has meant they have never replaced traditional non-degradable plastics in the mass market. A new Australian venture is producing affordable biodegradable plastics that might change all that. GENEVA March 8, 2004  DuPont Engineering Polymers and Toyota Motor Corp. confirm the feasibility of DuPont Composite Recycle Technology as a means to reclaim and reuse nylon 6 from automotive air intake manifolds and reduce the environmental footprint. These findings are being released this week at the International Automotive Recycling Conference (IARC) in Geneva. CANBERRA, Australia, March 3, 2004 - The Australian Supermarkets are on track to achieving a 25% reduction in plastic bag use by the end of this year, according to Australian Minister for the Environment and Heritage, Dr. David Kemp. "I'm delighted to say that supermarkets have responded magnificently to Governments' challenge to slash the number of plastic bags they issue," Dr. Kemp said. A new report suggests that electronics manufacturers in Europe may need to spend up to $40 billion to prepare takeback and recycling systems for compliance with the Waste Electrical and Electronics (WEEE) directive, which takes effect in 2006. A 55:45 joint venture formed by MBA Polymers (Richmond, CA) and Guangzhou Iron & Steel Enterprises Holdings Ltd. (GISE), called GISE-MBA New Plastics Technology Co. Ltd., will build and operate a mechanical recycling plant for end-of-life (EOL) E/E goods, white goods, and automotive parts in the Nansha development area, using MBA's separation technology. The technology separates not only plastics from the (mostly mixed metals) shredder residue but also separates plastics by material. The Welsh Assembly is making an extra £33 million available for reducing and re-using waste in Wales over the next three years. Minister for Environment, Planning and Countryside Carwyn Jones revealed the measure after the announcement of the Assembly's latest budget. The minister said: "This budget reflects the Welsh Assembly Government’s commitment to reducing the amount of rubbish we send to landfill sites. At present, we send some 87% of our household waste to holes in the ground, and this practice simply cannot be sustained." NAGPUR, September 22, 2004 - GLOBAL crude oil prices continue to peak. 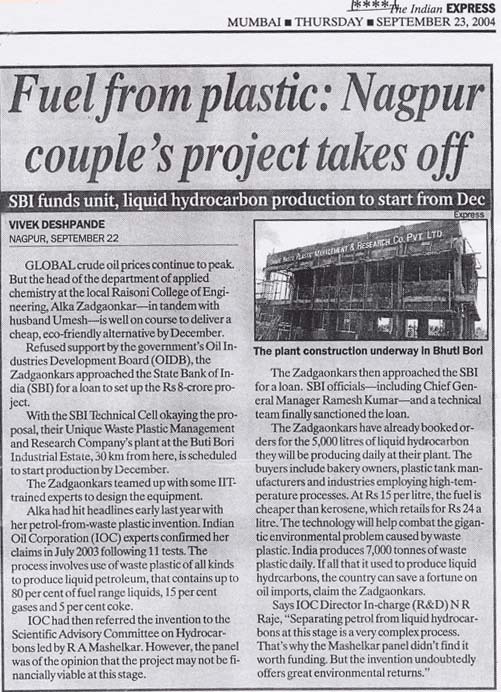 But the head of the department of applied chemistry at the local Raisoni College of Engineering, Nagpur, Alka Zadgaonkar - in tandem with husband Umesh - is well on course to deliver a cheap, eco-friendly alternative by December. 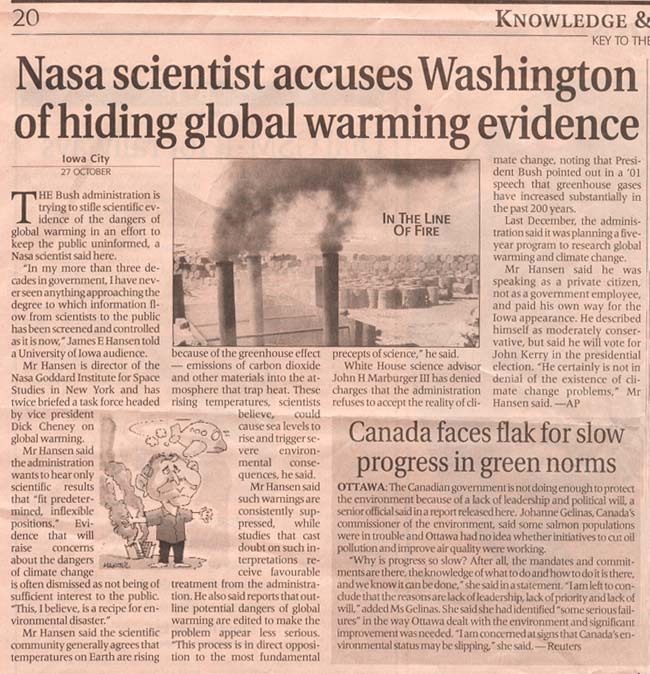 IOWA CITY, October 27, 2004 - The Bush administration is trying to stifle scientific evidence of the dangers of global warming in an effort to keep the public uninformed, a Nasa scientist said here. Pacific News Service - San Francisco,CA,USA, Nov 30, 2004. Hanford, CA – “They’ve been planning to build a toxic factory in my neighborhood, and I just found out about it?” exclaimed an indignant neighbor of Hanford, a small town 45 miles south of Fresno, whose population of just over 40,000 people.... For months, the group Kings County Residents United for Health has pressured the company Plastic Energy to explain the environmental and health consequences of installing a fuel-generating plant that would utilize plastic as its primary material. Nearly every time a new electrical item is bought, an old one needs disposing of. But are we doing so properly? DuPont's newest polymer innovation, the first DuPont polymer derived from a biological source, has been recognized by the China State Intellectual Property Office and China Central Television (CCTV) as "Most Visionary Innovation" at a recent award ceremony.